Simultaneous interpreting is the usual working mode for conferences, discussions, assemblies, professional events and other large meetings held by public and private organizations. Montse Foz makes all of her experience available to offer a high quality service that is always suited to the circumstances, whatever they may be. In simultaneous translation, the interpreter listens to the speaker and simultaneously translates their words to one or more listeners. To do so, the interpreter works inside a booth equipped with headphones, and broadcasts the translation through a microphone, with no need for the speaker to stop their presentation. 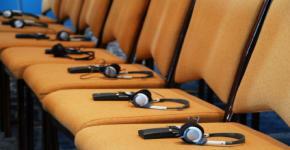 Meanwhile, listeners use headsets to follow the translation in real time, and are thus able to naturally focus on the speaker’s presentation. High precision and quality in communication. Professional appearance and experience in all types of events.